This is not much of a Jeeping trip, but it is a great day of fantastic scenery and interesting history. Lots of miles but only 6-7 hours, even if you take time to explore. Scenery and lighting is far better if traveled counterclockwise. Start the trip at La Sal Junction on US 191 and head east into Colorado. A short distance into Colorado is a scenic overlook of Paradox Valley. 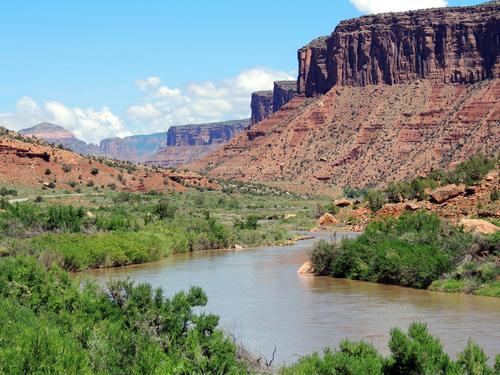 The valley was named in 1875 by geologist and surveyor Albert Charles Peale, after he noted that the Dolores River had a "desire to perform strange and unexpected things" in the area. Instead of flowing down the valley, the river emerges from a narrow gap in one wall, cuts perpendicularly across the middle, and exits through another gap. Paradox: A seemingly absurd or self-contradictory statement or proposition that when investigated or explained may prove to be well founded or true. Drop down into the valley and to the "town" of Bedrock. A couple miles after the town, turn left on County Road Y11. Moab to here is 1.25 - 1.5 hours. This is a graded road through the upper part of Delores River Canyon (photo) and connects to Colorado Hwy 141. Very nice run through a narrow, high-walled canyon ending with the remnants of a "Hanging Flume". Construction on the Hanging Flume took three years, beginning in 1887. Approximately 24 workers participated in the build, suspended from ropes onto the cliff face. A derrick may also have been used. The construction used 1.8 million board feet of lumber and ended up with a total cost over $100,000. The timber used was mostly Ponderosa pine, a local tree, and it was supported using iron rods. The completed flume was approximately 12 miles long and up to 75 feet above the river. 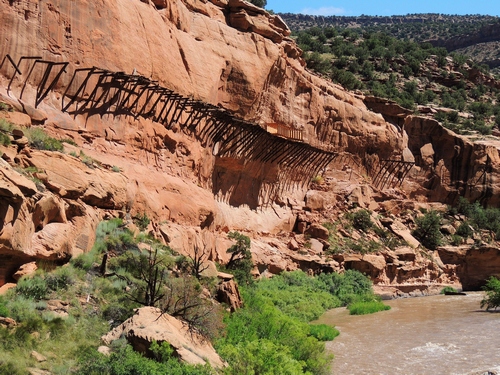 It began on a dam on the San Miguel River above Uravan, Colorado. The flume's opening (the headgate) no longer exists, and the connecting ditch has been filled. The actual wooden flume was 6 feet wide and 4 feet deep. When in use, it conveyed 80,000,000 gallons of water each day. A short section has been reconstructed to show what it looked like. The flume was only used for three years before being abandoned. The reason was that the mine itself was closed after the discovery that most of the gold was unrecoverable, and the investors in the project only made $80,000 after investing over $1,000,000 into the mine and associated engineering works. After the closure of the mine, local residents reused the timber. Wish we had found this self guided tour before taking the trip. There is a GPS - gpx track at the bottom of the page. Head north on CO HWY 141. 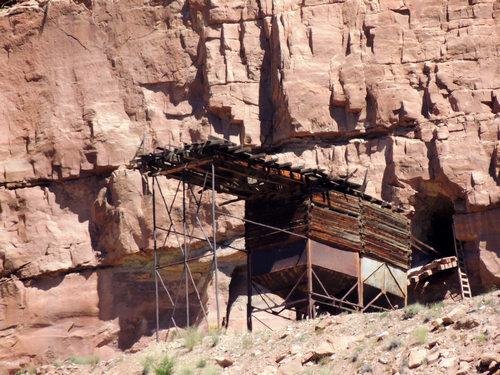 Look high on the cliffs and you will see mining remnants of the uranium boom. Watch the low side of the road for a charcoal oven. This oven burned local timber to create charcoal for the small forges used along the Flume. 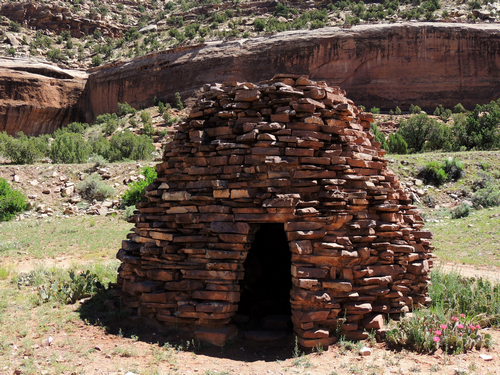 When you are finished in this area head north along the Dolores River to Gateway. The scenery is spectacular. 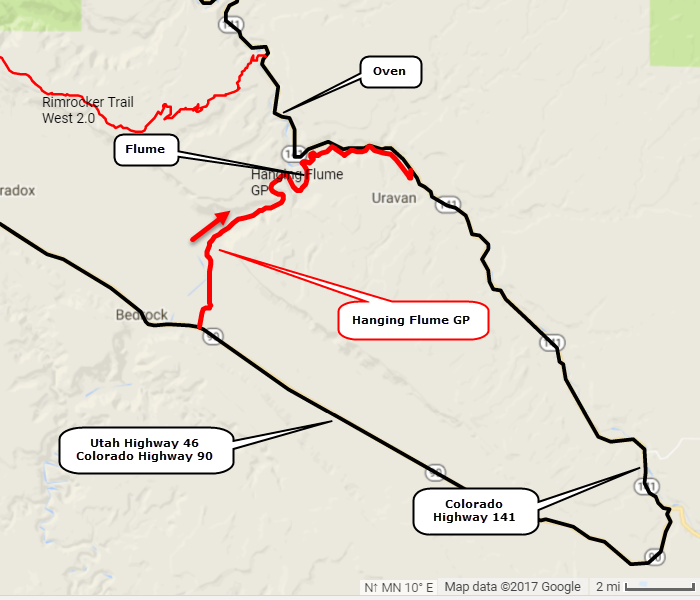 Turn in Gateway and return to Moab via 1A Gateway Road GP. 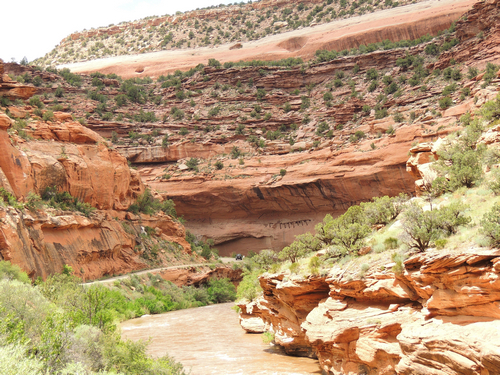 Dolores River between the Hanging Flume and Gateway.